USW Health, Safety and Environment Assistant Director Jim Frederick attended the 25th anniversary commemoration of the Westray mine explosion on May 9, 2017. The explosion took the lives of 26 miners in Pictou County, Nova Scotia. "“The USW, family members of the victims and others gathered to commemorate this horrible and needless tragedy,” Frederick said. 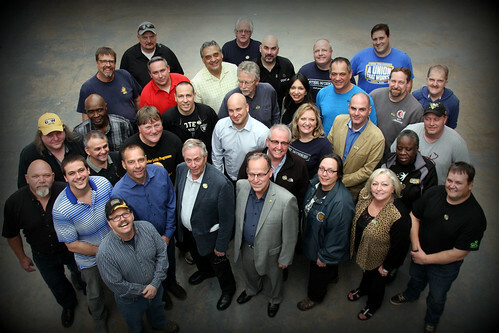 Staff members in the photos include USW National Director for Canada Ken Neuman, District 3 Director Steve Hunt, District 5 Director Alain Croteau and retired National Director for Canada Lawrence McBrearty. Also pictured are health and safety staff Nancy Hutchison, Al Hedd and Gerry LeBlanc, along with D6 H&S Coordinator Sylvia Boyce, D3 H&S Coordinator Brian Harder and retired staff Andy King. Many other USW staff and local union representatives from across Canada, and retirees that had been involved with the Westray tragedy for 25 years, were also in attendance. Photos are credited to Jim Frederick and Peter Boyle.